A classic wedding image is a beautiful bridesmaid dress with long headdress, which remains trendy and relevant at all times. 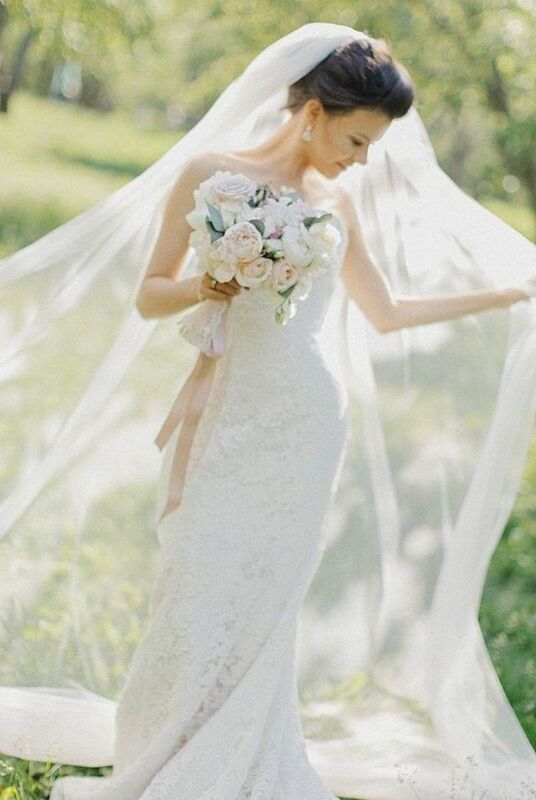 It is good if the girl who are married, wearing long veil – a symbol of her purity, innocence. Future wife, preparing for the wedding, often have difficulty in choosing a dress. There are so many styles, images styles. 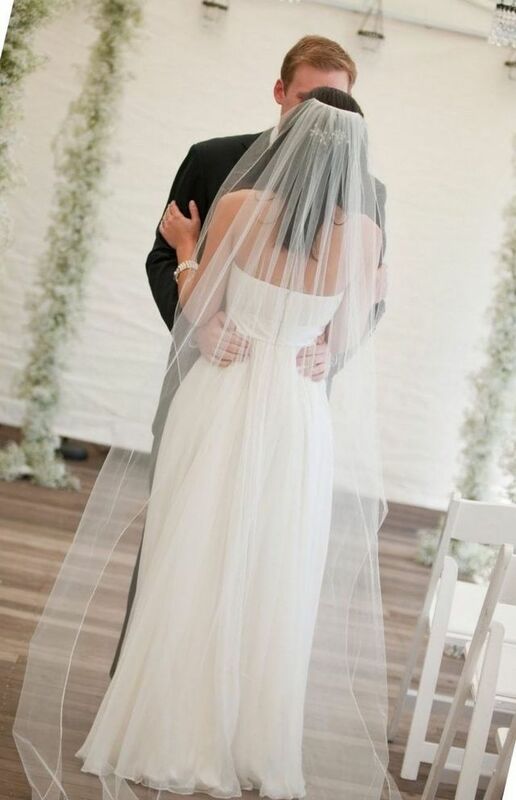 If with the dress you’ve already decided, but do not know how to choose a wedding veil, this review will help you. 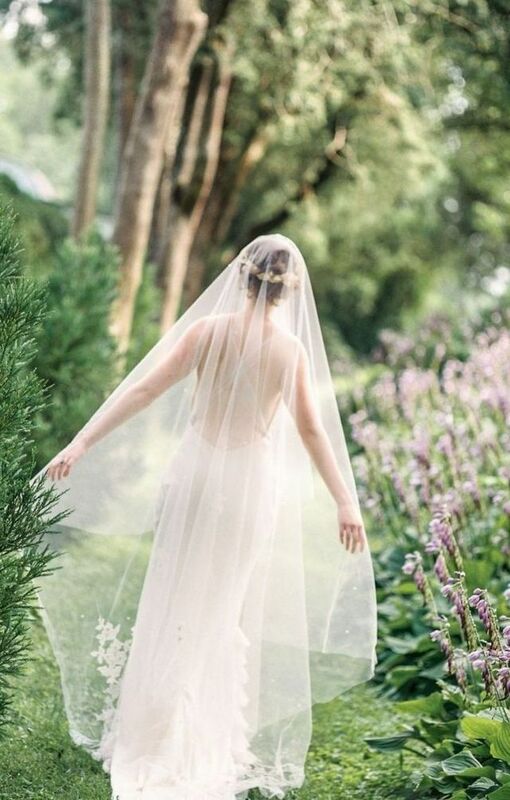 A long veil is the accessory of the bride. 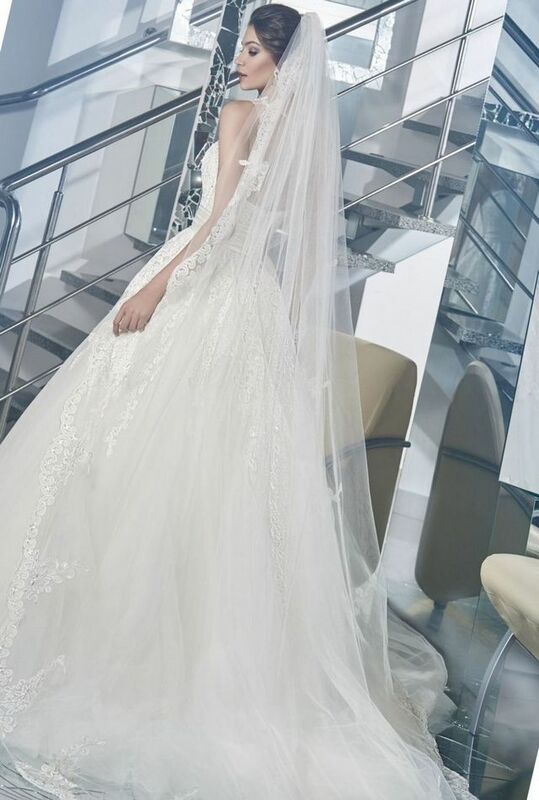 A variety of styles and the length of the headgear is some difficulty with his choice, so it all depends on your personal preference and style of wedding dresses. Is the one long veil that reaches the knees of the girl and below. This headpiece bride classified by type, each of which correspond to a certain wedding style. 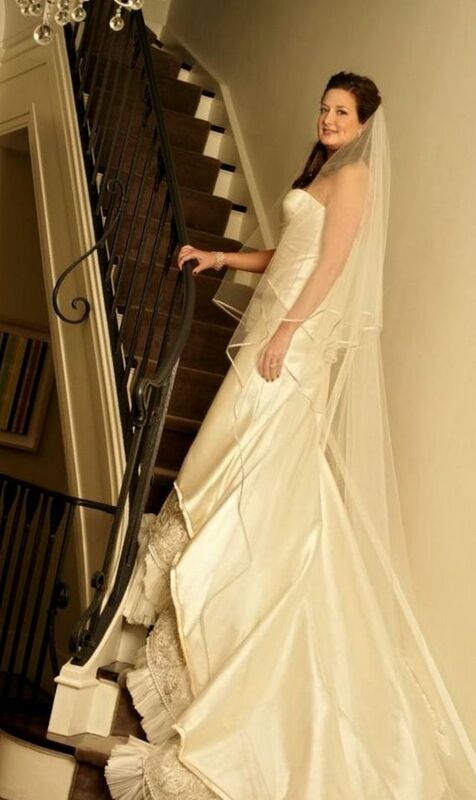 This style wedding headdress highlights charming femininity and elegance of the bride. To married the girl was able to waltz at your wedding, the length should reach one to one and a half meters and reach up to the Shin. This wedding style was in great demand in the late XVIII – early XIX art. and successfully survived until our days. 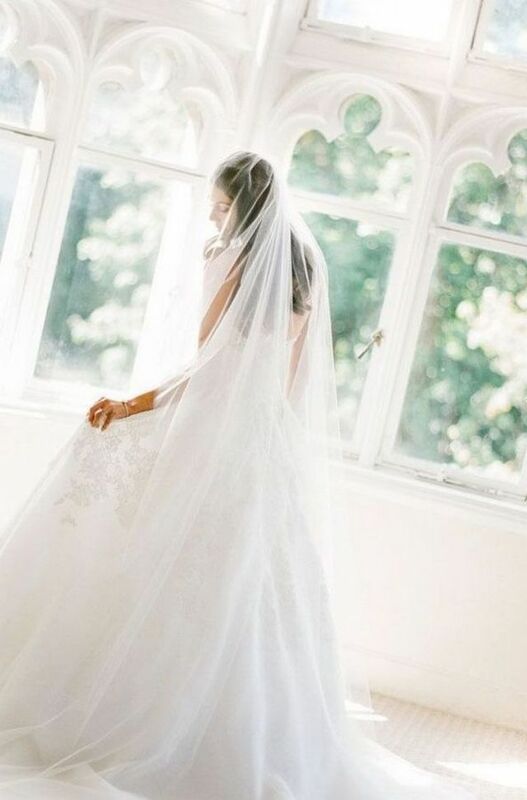 Long veils “the Chapel” for a more formal wedding celebration with a huge number of guests, ceremony marriage according to all the traditions. The model has long beautiful trail that drops from the bride to the bottom, nicely lying down on the floor at the feet of the girl. 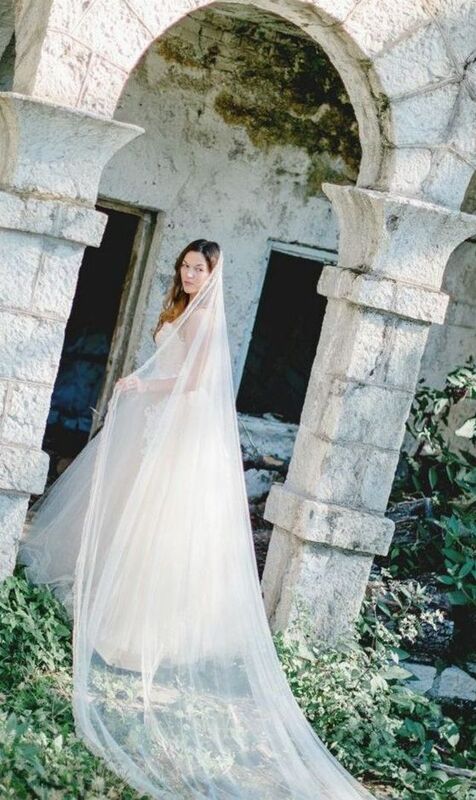 Length wedding veils “Chapel” often reaches three meters, and requires the presence of a luxurious, pompous image of the bride. 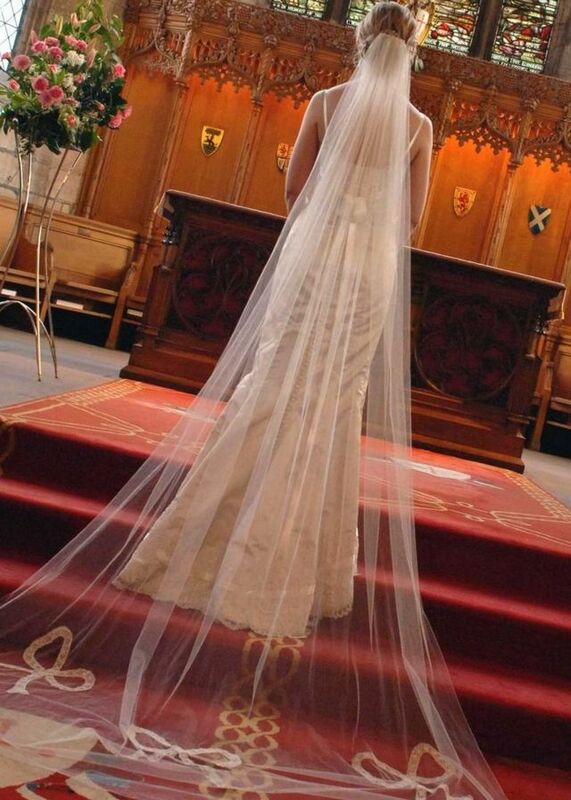 “Cathedral” veil even longer, she often sewed from a solid fabric tulle length in three and a half meters. This is ideal for wedding ceremony in the Cathedral. 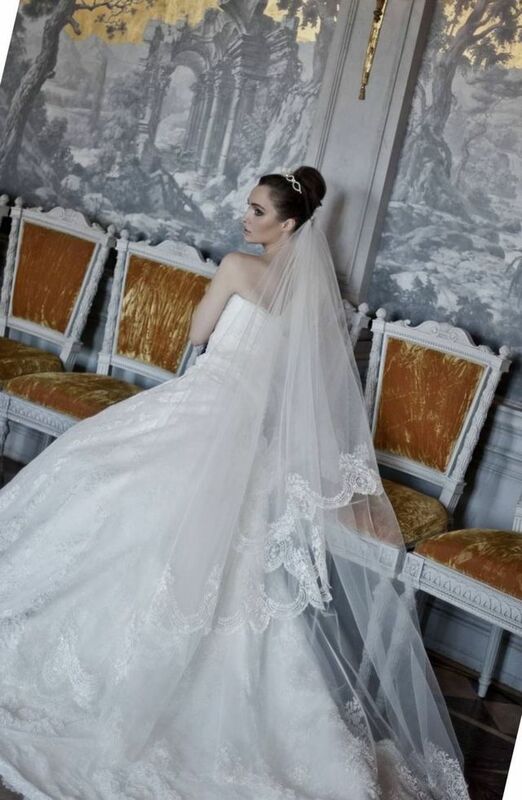 The combination of long train and wedding dress creates the delicate likeness of the divine image of the virgin Mary. In this dress you will be able to make many memorable images in the Church, in receiving the heavenly blessing on the marriage. Next along the length of the view of the Bridal veil – Cathedral. It often reaches four meters in length and coincides with a train wedding dresses. 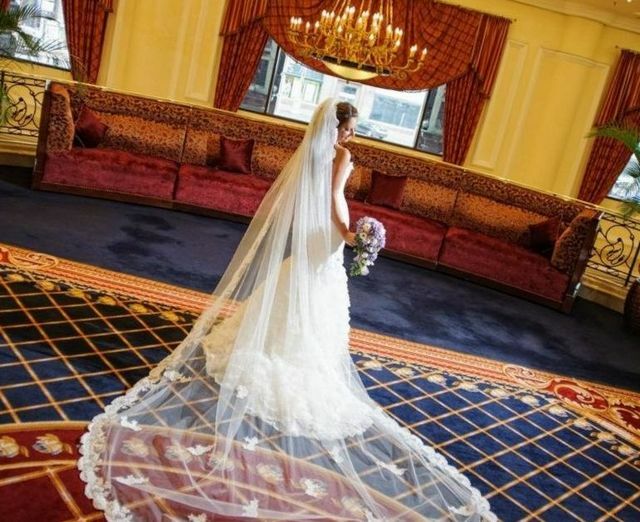 This refined version of veil to the floor creates the most solemn, elegant image of the bride. However, many consider it to be impractical, because the bride has to watch literally every step. The severity of the head-dress quickly gets tired, and want to take it off. Ideally, the immediately after wedding ceremony you replace the accessory shorter. 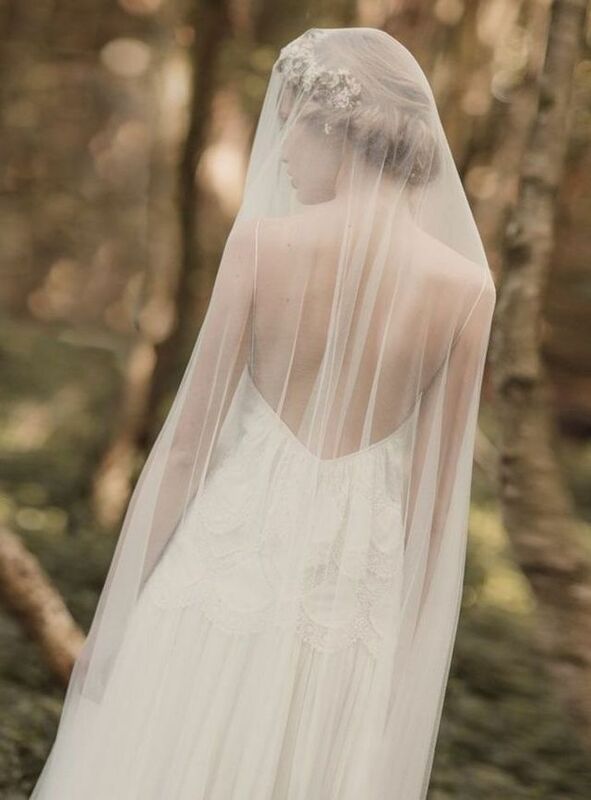 Often a veil of this length doing in an Italian style with beautiful handmade lace on the edge. The dress is fastened at the crown of the bride, creating the illusion as if he’s about to fall over. Fata “Italian lace” creates the most chaste, gentle way, giving femininity and religiosity of its owner. A long piece in the Italian style goes well with lace wedding dress on the figure. Especially good it will look, if the train of the dress is a bit shorter. 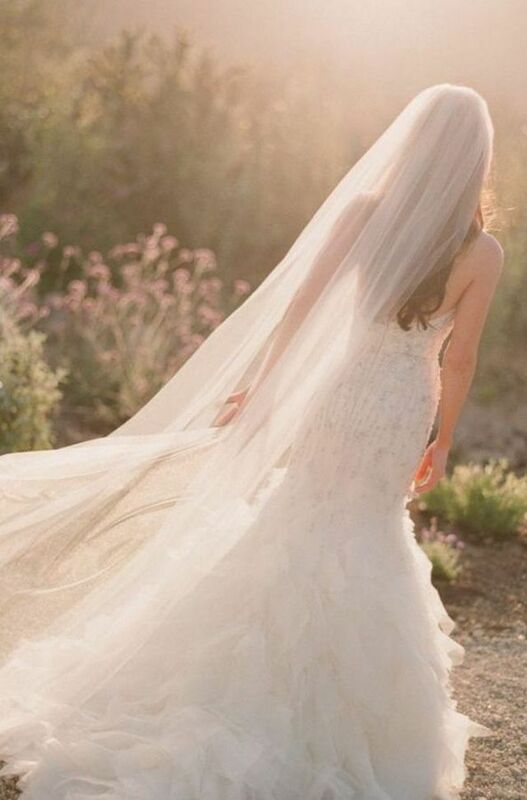 How to pick up the veil under wedding dress? 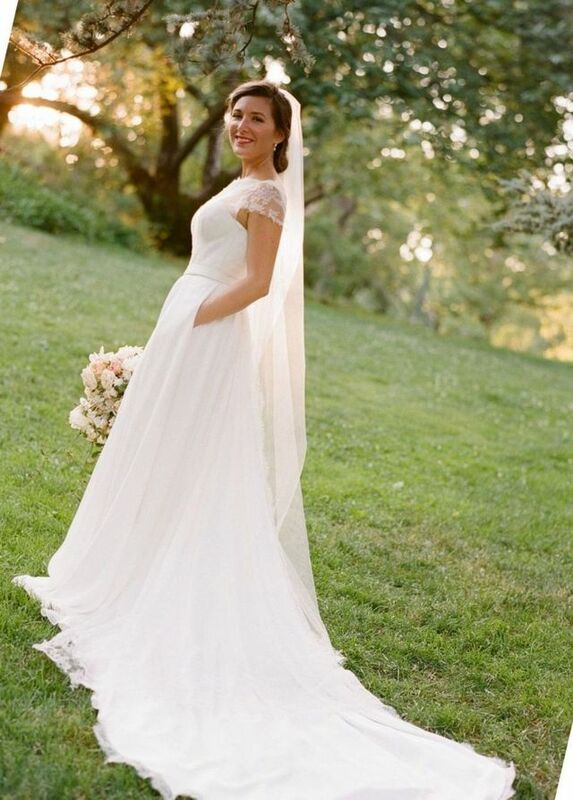 If you are the owner of plus size, curvy veil it is best to refuse, and to choose a more modest option along the length of, for example, “Waltz”. You need to Refine your silhouette, it does not flatten the veil on the shoulders, and just pin it at the bottom of the hairstyles she’s thin line hanging down, revealing a beautiful wide semi-circle from top to bottom. 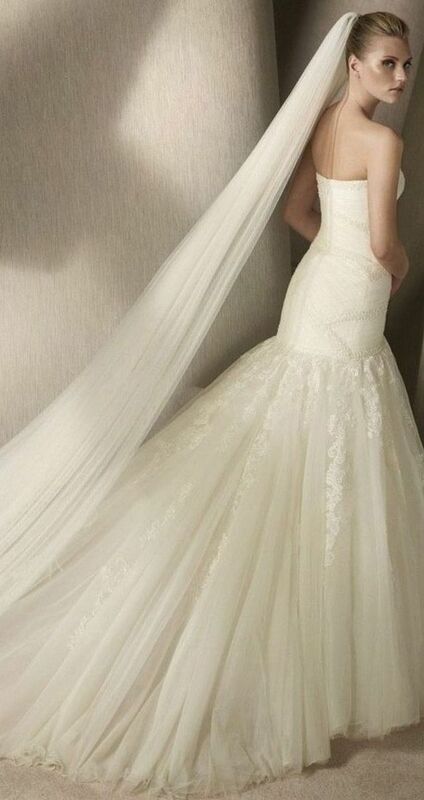 Strictly follow the same color scheme wedding dress with a veil. They should not differ in color or on a single tone. If the dress contains the details of a different shade, you have to beat it and veil, for example, to make the same tone edging. Please note ornaments, which decorated the dress: try to keep the harmony of the integral image at the time of choosing a headgear. For example, if the dress is richly embroidered with stones, Fata should be concise, simple and unadorned. If it has a finish, it must overlap with the décor of the wedding dress. 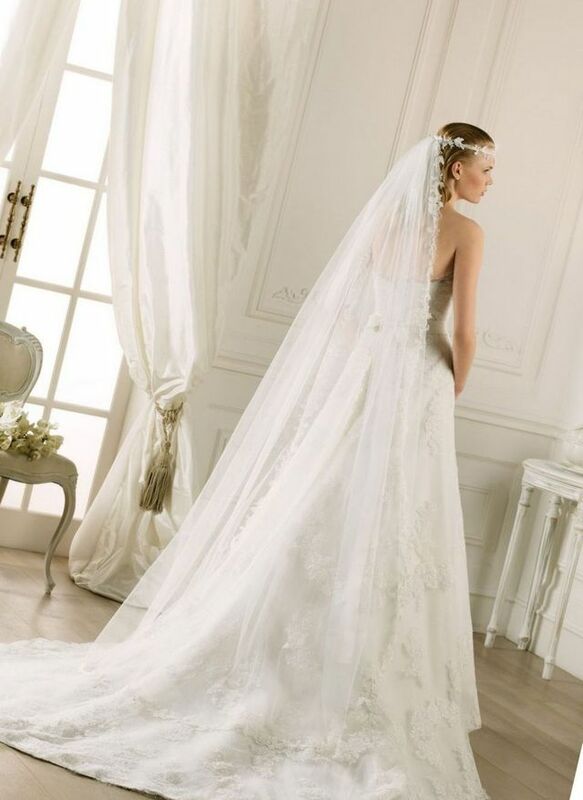 Use the same embroidery, lace for decorating the dress with a veil – it should be in the same style. It is important to selectively approach the choice of wedding hairstyles. You should consider the style of Bridal veils and wedding dresses to a whole image looked harmoniously, without causing dissonance. 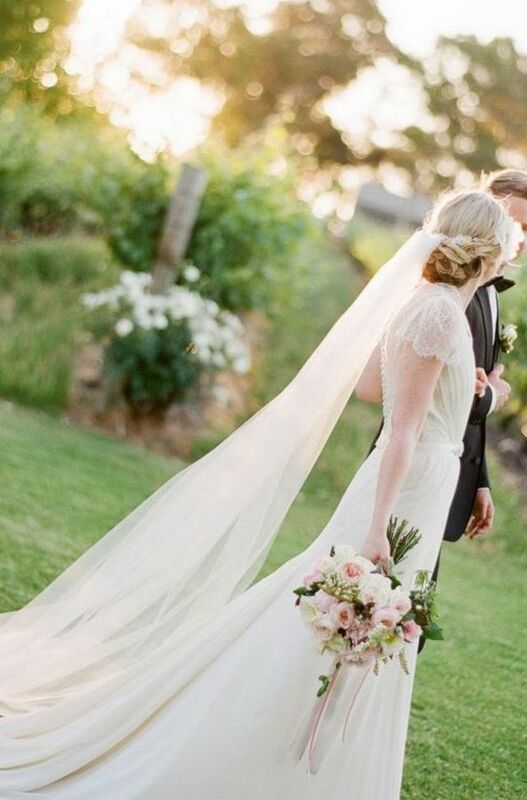 A long veil is considered a classic option, therefore, choosing the traditional hairstyle, you will never regret it. This is the perfect sleek styling, where your hair in a bun on the top or the back of the head. 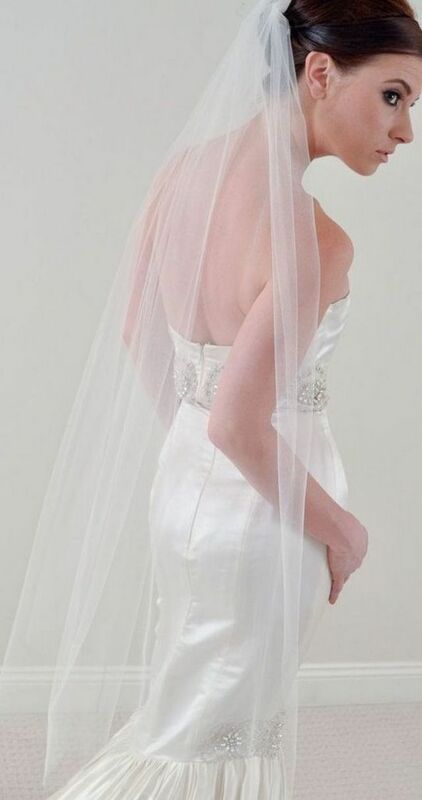 Look great wedding hairstyles with long veil, if it is a thin, single layer, decorated with lace. 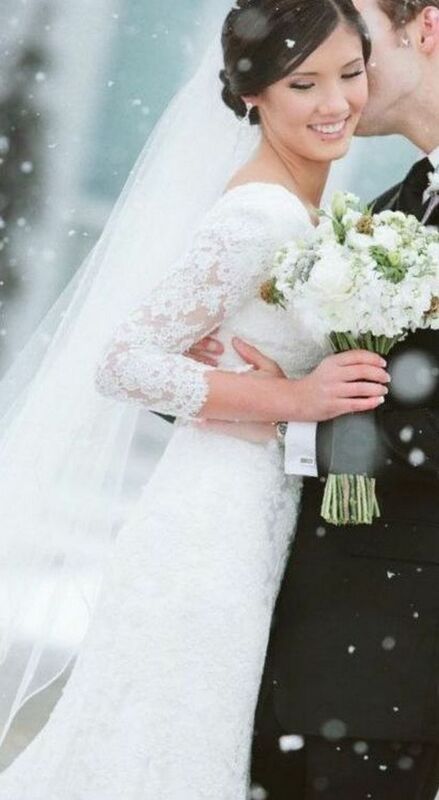 Wedding hairstyle with short hair and lace veil. Create volume styling option, making the curls in the form of light waves. At the top of the top clip headdress. Will make a romantic image. Decorate her hair with sparkling diadem. 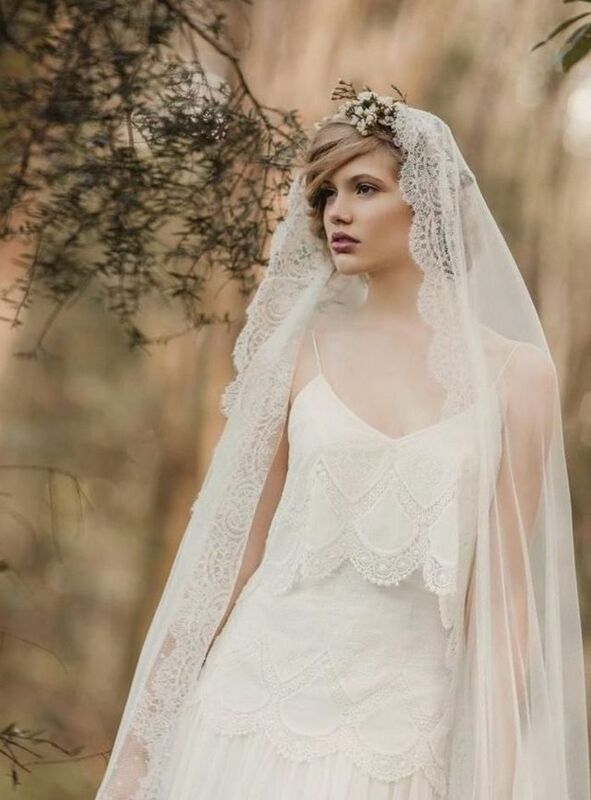 Bridal veils with lace combined with a sophisticated wedding hairdo. Use different braiding twisted into a single bundle of curls, attach veil (better dulaunoy) in the lower part of the occiput. So you can effectively close the face during the ceremony. Create a romantic look and dismiss long ringlets, pre-wind them into large curlers. Let the strands settle down in a chaotic manner, creating an easy negligence. Veil attach with a hair clip or comb. 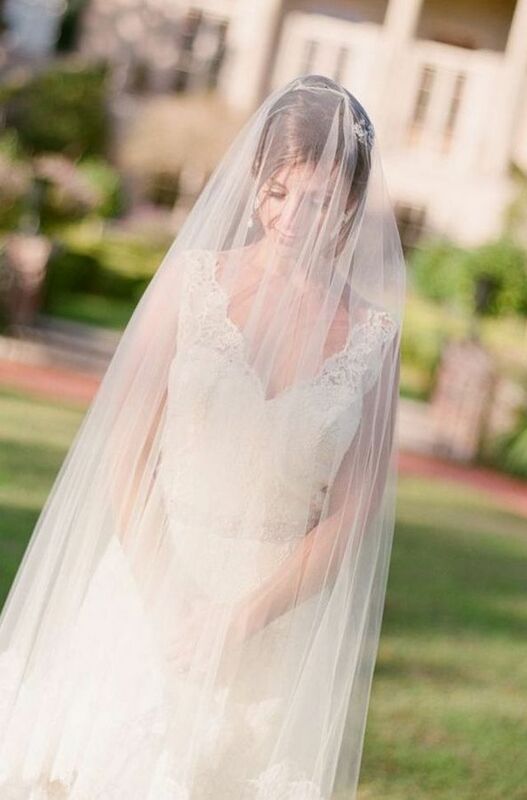 How to fix a long veil with your hands? Creating elaborate hairstyles for a wedding, you should consider fixing veils. The bride looked finished, hair should not fall under the weight of a long headdress. For a start pick up the level of attachment to a particular area of the head, to veil looked beautiful. Use various pins, invisible hairpins or combs to securely attach the headdress to the hair. Veil is very heavy. Select the right zone of attachment, throughout the day hair is not “collapsed”. 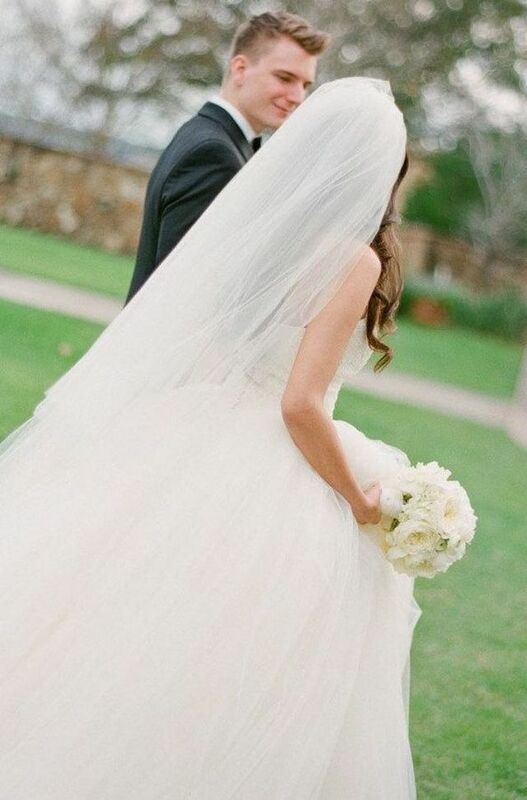 If you like style with gorgeous flowing locks, note the subtleties, without which it is impossible to attach a veil. Amongst the many options of veils to the floor you will find one that might win your heart is the Royal veil. It may extend beyond the bride for several meters. To cope with such length and move freely, the girl takes a couple of pages. However, if you close your eyes on all these inconveniences, this model gives extremely Bridal veils majestic and luxurious look to the bride and the wedding celebration as a whole. 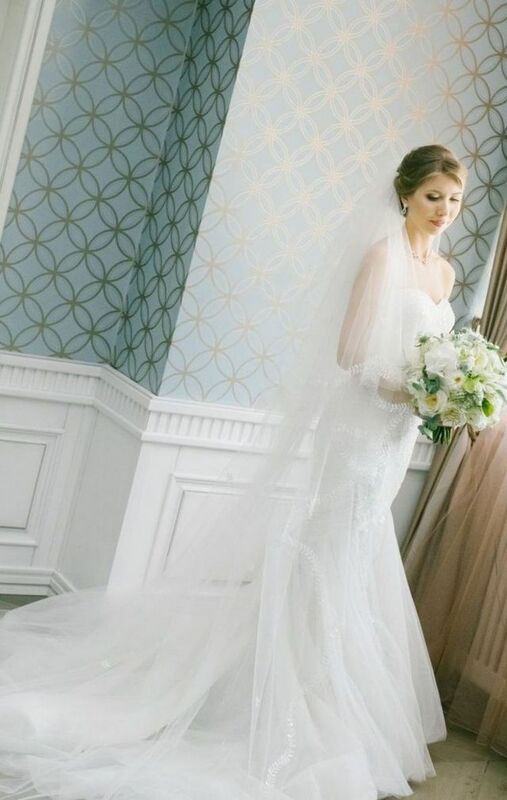 This image of wedding dress gives invited guests pleasant emotions and also indicates the style and scope of the festival, the main of which are the aristocratic couple.